Fittest “Family” Fun Night: Wednesday, July 15th – Fun and frolics – and prizes! in Le Chéile Park from 7 pm. Teams of 4 – €5 entry. Contact Mick Dee 086 8555 821 for further details. For all ages from 6 to 106! Refreshments / shop available in park on the night. 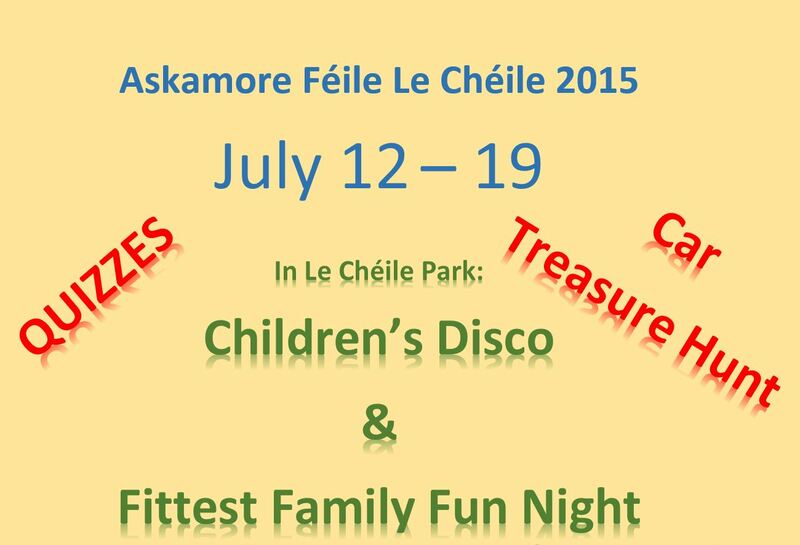 Children’s Disco in Le Chéile Park: Friday July 17th: 7 – 9 pm. Fun and dancing. €3 per child – refreshments included. Refreshments / shop available in park on the night. Car Treasure Hunt: Saturday, July 18th from 7 pm, leaving from Askamore Community Centre. €10 per car. This entry was posted in Community Council, Féile le Chéile and tagged Féile, Féile le Chéile, festival by admin. Bookmark the permalink.